The Color Force LED batten range is a brute of a light. The super bright fixture easily washes up to 8m / 26 foot. In addition, our advanced ColorSure RGBA color and control management technologies together give you a radically increased color palette, enhanced color consistency, a high CRI of 92 and theatrical grade dimming, all in the same fixture. The parlite is the Ideal digital substitute of the analog par can & is the worlds #1 truss toner. Its features include: 75-82% energy saving compared to traditional technology at the same brightness,Cosmetic design for hi-end installations, only 3 kg (7 lbs), Thick aluminum, long lasting light source in long lasting body, Variable light projection angles via quick lens change (standard: 12°;optional: 30°, 13°x40°, 110°), No fan, no maintenance, no noise, Can be transformed in IP 65 at any time, ETL approved, Internal/external gel frame (standard size for lighting industry), Auto-sensing power 90v-250v, Smart build “Quick Stand” tucked into yoke. 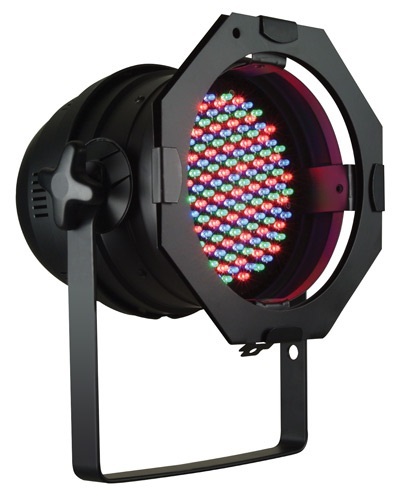 The LED PAR 56-24B features high-power color mixing with 24 1W red, green and blue LEDs and responds to 3- or 7-channels of DMX control. It produces a bright, narrow beam that cuts through fog and is ideal when a concentrated light is needed. Its features include: 3 or 7-channel DMX-512 LED PAR can Operating modes: 3-channel: RGB control, 7-channel: RGB, macros, run/strobe speed, automatic/sound, dimmer, Static colors and RGB color mixing with or without DMX controller. It also has Built-in automated programs via master/slave or DMX with variable speed, Built-in sound activated programs via master/slave or DMX, Pulse effect with adjustable speed, High-power, 1W (350mA) LEDs. 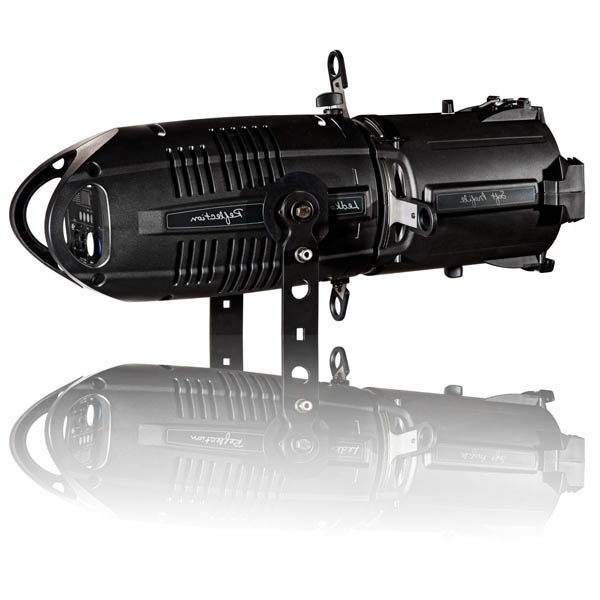 The ADJ P64 LED Plus offers full Master/Slave operation in any operational mode allowing more creativity to the user. The P64 LED Plus has a large palette of colors with smooth RGB color mixing from it’s 151 bright 5mm LEDs, and features Electronic Dimming, color strobe effect and long life operation. Its features include: Ultra bright black Par 64 with 151 5mm LEDs (51 Red, 49 Green, & 51 Blue LEDs), Long Life LEDs (100,000 hrs. 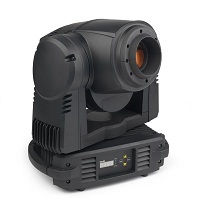 ), 4 operational Modes: Sound Active, Auto, RGB, DMX Control, Beam Angle: 30 degrees, DMX-512 protocol, Color strobe effect, Uses 6 DMX Channels, Stand Alone or Master/Slave Configuration, Linkable via 3-pin XLR cable, Electronic Dimming: 0-100%, Weight: 5 lbs./ 2.2 kg. C-Splash is an ultra-thin, submersible fixture designed to provide vibrant color and color-changing light in fresh and saltwater locations to a depth of 15 ft (4.6 m). With its watertight cast brass housing and silicon bronze adjusting hardware, C-Splash is perfect for water-based applications such as fountains and theme park installations, as well as for applications situated in harsh environments. Some of its features are: This IP68-rated fixture is also able to withstand water treated with bromine or chlorine. The frosted tempered glass lens offers a soft-edge beam of light at 22 degrees, while the clear glass lens offers extended light. It works seamlessly with Philips controllers, including iPlayer 3 and Light System Manager, as well as third-party DMX controllers. It has a locking base and pivot allows vertical and horizontal rotation through a full 360 degrees. 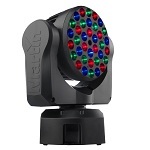 It also offers the full range of 16.7 million RGB colors and an output of over 500 lumens. Long-life LEDs significantly reduce or eliminate required maintenance, a major advantage for underwater installations. 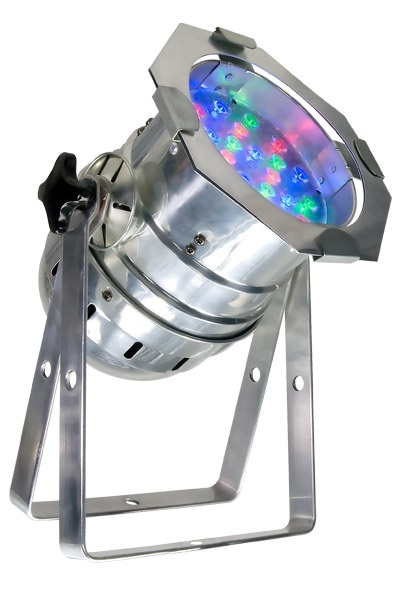 This fixture is perfect for illuminating pools to change colors or make them what ever color you want. Especially when you have a see through stage built over the pool. Italian made this new age leko is an innovative “Multi-LED” light source that produces uniform beam with no pixels or dots. It has full spectrum color mixing +all whites from 3200 k to 9000 k + digital color filters. Some of its other features include: no more multicolored shadows, soft/hard edge profile, instant gobos from your standard printer and its ideal for very low noise applications. It features: An innovative “Multi-LED” light source producing uniform beam with no pixels or dots (Patent Pending), full spectrum color mixing + all whites from 3200K to 9000K + digital color filters, no more multicolored shadows, soft/hard edge profile, instant gobos from your standard printer, available and / or compatible with various standard optics and accessories, and ideal for very low noise applications. 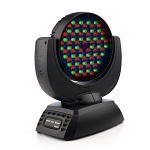 The MAC 301 Wash is an LED moving head wash light with a powerfully fast zoom and impressive zoom range. It is capable of producing a wide range of exceptional colors from rich saturated shades to pastels through the entire zoom range.